Don't question me, fake person. Now that we can put that unpleasantness behind us, we can move forward. Hawkman has been synonymous with confusion. I'm going to estimate here, but I think he has had approximately 73 different origins since his first appearance in 1940. 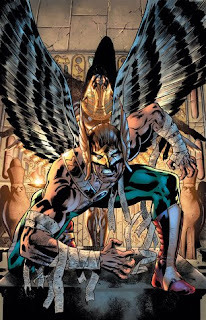 Robert Venditti handles the latest incarnation of Carter Hall and his winged alter ego. As hesitant as I was to read anything about a character who is more confusing than new math is to a 40 year old, I decided to give it a shot. I have never said in my life that Hawkman is my favorite book currently. WELL, IT IS. Carter Hall is having not only flashbacks of his past incarnations, but he is crossing time and meeting them, too. We also learn that he has not just been reincarnated on earth, but also Krypton, for example. I am not sure if he has been reincarnated in Missouri (I don't consider that to be part of earth...more like an active portal to hell). Venditti has succeeded in weaving a tale that pisses you off when the issue is done. Now I have to wait another month. I wonder what the pitch looked like at DC. Did Mr. Venditti pitch this? Or did DC? I imagine if it was the latter, Venditti had to have some hesitation, even if only internally. This is a character who has never seen triple digits in any of the 475 series that he has had over the years. I hope the quality of this book can be sustained, as I can't get enough. On Twitter I gave it 9 out of 5 stars. Here on the blog I will give it 9 out of 5 pieces of Nth Metal. This blog is all about comic books, comic movies, TV, Sci-fi and a lot of other stuff. I hope you enjoy! Feel free to comment.